Sometimes when we go to an auction--I will bid on something I should't. I admit, after all these years of buying--I will bid on something that just grabs me--without a great deal of thought of whether it is too odd to sell. I will buy something and worry about how to unload it later. Take pie plates for example. Lots of pie plates. Like 100 of them. 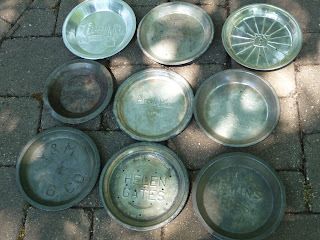 This is just a sampling of someone's collection of tin and other metal pie plates that we purchased--most of them with the name of the brand of pie embossed on the piece. Take this one for example. 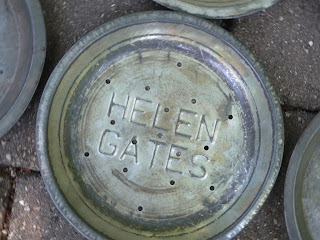 Helen Gates it says. 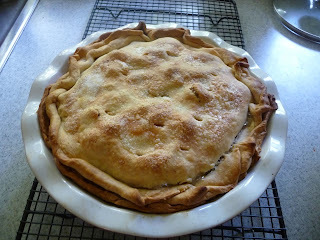 The pie dish has holes in the bottom which help the pie stay nice and flakey and not get a soggy crust when baked. My perfunctory research did not turn up a commercial pie operation for Helen Gates pies. Helen of commercial pie fame will continue to be a mystery. But I know for certain--I bet our Indiana Helen was a very kind and popular lady--especially at church potlucks.